a book chick: "How to Be an American Housewife"
"How to Be an American Housewife"
my take: When American service men were stationed in Japan at the end of WWII, many found Japanese brides to bring home. 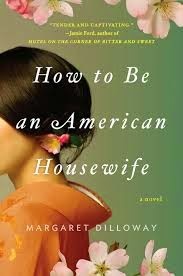 This novel loosely tells the author's parents' story and each chapter begins with a paragraph from a fictional guide to becoming an American housewife - helpful hints for navigating the difference between Japanese and American cultures. The story flips back and forth between Shoko's upbringing in pre-WWII Japan and her and her daughter's lives in modern day United States. Shoko has secrets she wants to divulge and reconciliation to make before she dies. I discovered this book several years ago while getting my nails done - the young Vietnamese woman helping with a little glamour was a reader (yay!) and had this from the library. Now that I've read it, I'd love to find her back and see if the book rang true for her in the cultural assimilation department.